Dean of Undergraduate Studies Steve Roberson describes the mentoring aspect of the UNCG Guarantee program. In addition to the scholarship, each recipient will also receive a customized plan to support his or her academic success. 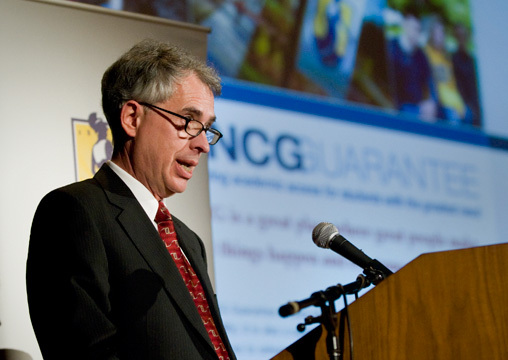 In February 2010, the university launched the UNCG Guarantee, an exciting initiative to help eligible North Carolinians graduate in four years with little or no debt. Although UNCG continues to be one of the most affordable public universities in the nation, our commitment to improving access to quality higher education is critical considering the number of in-state students whose families cannot afford college tuition. UNCG Guarantee is more than an outstanding financial aid package for those who qualify. It also provides talented students with a customized plan for their academic success as well as mentoring from UNCG faculty, staff and alumni. Initial funding was largely made possible through a $6 million gift from an anonymous donor who made national headlines in 2009 by donating $100 million to several American universities.